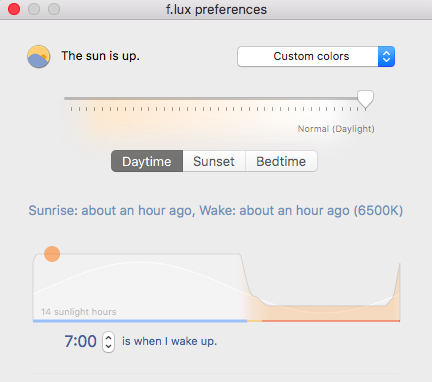 I just notice when I update to the latest version that the colors aren't the same in daytime (set at Normal (Daylight)) in the f.lux preferences compared to the colors I have without f.lux. Without f.lux, the screen is more contrasted with a gray more warm than the one I get with f.lux witch is colder... (I'm not sure I described it correctly...). I prefer the color I have without f.lux for the daytime, but I like having the colors get warmer with f.lux at the evening. Note : I'm under macOS Sierra, public beta 16A293a. The duration of sunset is too small, I want to configure this duration to extend it like 2h. Is it possible to have this functionnality in a further update ? We load the "VCGT tag" from the system ICC file. Historically, we have matched Apple's loader exactly. There seems to be a lot of new color work going on in Sierra, and it's possible that they are doing something "better" than VCGT, but I don't know what it would be. There have also been a couple bugs recently where Apple's automatic brightness has managed not to load the system profile at all, so in that case we do the "right thing" and load it. If you go to System Prefs > Displays > Color and drag your ICC file to an email you can send it to us at support at justgetflux dot com. Ok, I just sent the email with the color profile. As I have to reboot to install the new public beta, I'll do the same with the "new", or not, color profile. @herf I have a similar problem. I have calibrated my monitor, but when flux loads, it loads the default profile instead of my calibrated profile. Even if it set it manually during the daytime, flux keep resetting shortly afterwards to the default profile. This is in 10.11.6 and wasn't a problem with old builds of flux. @abdb1 we do save and restore the alternate profile - seems like lots of stuff is moving around in the OS right now. We'll do some more testing on this, but f.lux should always keep your selected profile. @MilesTEG1 Hey Miles - just sent email, but the profile you had selected was the standard "sRGB" profile, which you might embed in a JPEG, etc. But to f.lux it does not look like a device profile, so it is resetting. I just sent you an email, with the new color profile. To summarize, with the new public bêta 10.12 (16A304a), I don't have anymore the problem of colors changing in daytime with the 37.7 version. I try the new 37.8, and no more problem too. My guess, it was the fault of the previous beta witch mess with color profile somehow. Ok, thanks we will assume no new problems then. I fixed the problem on my machine. I opened up the flux preferences .plist file and removed the name of the profile listed, then restarted flux. It now correctly loads the profile I have selected. Interestingly, the profile flux kept loading was one with a long UUID tag (if that is the correct term for it) in the name.